"... To create a Great Yugoslavia and in it a Greater Serbia, ethnically cleansed, within the borders of pre-war Serbia, Montenegro, Bosnia and Herzegovina, Srem, Banat and Backa..."
"... To cleanse the state territory of all national minorities and national elements..."
"... To immediately create mutual borders between Serbia and Montenegro, as well as between Serbia and Slovenia, cleansing Sandzak of Muslim inhabitants, and Bosnia and Herzegovina of Muslim and Catholic inhabitants..."
"... Perhaps these goals appear great and unachievable to you and your combatants. Remember the great battles for liberty under the leadership of Karadjordje. Serbia was filled with Turks (Muslims). In Belgrade and other Serbian towns, Muslim minarets were prominent and Turks performed their foul-smelling cleansing in front of mosques as they are now doing in Serbian Bosnia and Herzegovina. At that time our homeland was overflowing with hundreds of thousands of Muslims. Walk through Serbia today. You will not find a Turk (Muslim) anywhere, you will not even find even one of their graves, nor even one Muslim grave stone ...."
"This is the best proof and greatest guarantee that we will succeed in today's holy battle and that we will exterminate every Turk from these, our Serbian lands. Not one Muslim will remain among us.... Peasants and other "little" people will be moved to Turkey. Our government in London, using the English allied and benevolent government, will endeavor to gain the approval of the Turkish government with respect to this (Churchill spoke about this in Ankara with Mr. Ineni). All Catholics who sinned against our people in our tragic days, as well as all intellectuals and those well off, will be destroyed without mercy. We will spare the peasant people as well as the low working class and make real Serbians of them. We will convert them into Orthodox by hook or by crook. There, those are the goals of our great battle and when the crucial moment arrives, they will be achieved. We have already achieved them in some parts of our homeland...."
This document directly shows the sources of Chetnik genocidal crimes against Croatians and Muslims which originated from the creation of the Serbian national state and its expansionist politics. Draza went further than Moljevic regarding territory, asking for more than 90% of Croatia territory for Greater Serbia in which more than 2,500,000 Catholics and over 800,000 Muslims lived, making up 70% of the entire population on that territory, while Serbians comprised almost 30% of the population. From Draza's "Instructions", all Croatians, Muslims, and other non-Serbians would have to disappear from this territory, either during the war or immediately after it. Croatians were given only about 10% of their territory at that time from Karlovac across Zagreb to Varazdin and approximately 1/5 of the NDH population. Accusations and allegations against Croatians and Muslims for all the evil and sufferings caused to the Serbians during the war existed for the purpose of constantly motivating Chetniks to execute punishments, that is, crimes of genocide against them. This is clearly stated in Draza's "Instructions". With respect to this, and with the same goal, is the exaggeration of Serbian victims caused by the Ustasa or, according to the Chetniks, by the "Croatians" i.e. the entire Croatian and Muslim peoples, starting with the number of 382,000 at the end of 1941, coming to over 518,000 at the end of February 1942, then 600,000 in October 1942, with 800,000 at the end of 1943 and finally, at the end of the war, arriving at the number of one million Serbians killed on NDH territory. This is absurd to any objective researcher and is shown in the work of the Serb, Dr. B Kocovic. Draza's threats of revenge against Croats and Muslims as a prerequisite for life and rights in a future state had the same aim. Also, in other program documents of individual Chetnik leaders and units similar arguments and goals are expressed. The "Elaborat" of the Dinara Chetnik division of March 1942, which was established precisely at that time and encompassed northern Dalmatia, Lika, and the southwestern part of Bosanska Krajina, also presented its aims and arguments. The principle goal was the creation of a "Serbian national state" where "Serbians lived and which Serbians aspire to...", that is, a "Greater Serbia" which would include Bosnia and Herzegovina, a part of Dalmatia, Lika, and other territories with a pure national system and "King Peter at the head" in which "exclusively the Orthodox populace would live". The rest was to disappear so that on March 25, 1943, the Dinara division gave an order to its units to "cleanse the Croatians and Muslims" from their territory. At the same time, "the establishment of a national corridor along the Dinara Mountain to link Herzegovina with northern Dalmatia and Lika", was assigned as one of the primary tasks of this division and the Chetnik movement, which they attempted to achieve, particularly in 1942 and 1943, through the cleansing of the local Croatian and Muslim population. Vukasin Marcetic, the commander of the Chetnik unit "Manjaca", stated the following at a conference of the Chetnik units on June 7, 1942: "I believe that Bosnia and Serbia are one nation and I hope that everything that is not Serbian will be cleansed from Bosnia." Milan Santic, a Chetnik leader, was even more direct. In his speech, in Trebinje at the end of July 1942, he stated that the goal of the Chetnik movement was to "establish a Greater Serbia" as stipulated by Draza and then said "Serbian lands must be cleansed of Catholics and Muslims. Only Serbians will live in those lands. The cleansing will be thoroughly executed. We will drive out and destroy them all, without exception and without compassion. This will be the starting point of our liberation". He further stresses that all of this "must be executed quickly and in one revolutionary momentum" and because of this Chetniks will "never formally recognize" the NDH. All of these documents illustrate that Chetnik crimes of genocide against Croatians and Muslims were deliberate and planned. The Muslims were even in a greater disadvantage than the Croatians. While Croatians were allowed the possibility of living in their own, albeit decreased, territorial units and in a future Yugoslavia, this possibility, according to Chetnik ideology, did not exist for the Muslims. According to the Serbians, Muslims were considered "a non-national element," an "internal enemy," and "Turks", and their destruction was considered to be the "most holy of tasks" to the Chetniks. This depended only on the military and given possibilities of the Chetniks and on the strength of the other military camps, as well as the situation in individual regions of this imaginary Chetnik Greater Serbia. In accordance with this, certain areas were cleansed of Croatians and Muslims. The organization of Chetnik military units was proposed in order to accomplish the planned genocidal crimes against Croatians and Muslims on the territory of today's republics of Bosnia and Herzegovina and Croatia, the then NDH. They were founded on NDH territory (south of the Sava River extending to the Adriatic Sea) with direct support from Italian and German occupying forces. On the basis of contracts, Axis forces provided Chetnik military units not only with weapons, ammunition, provisions, and salaries but were also often initiators and protectors of a great number of mass Chetnik crimes against Croatians and Muslims. The Chetnik movement did not fulfill its genocidal intentions because it did not possess enough military units. Yet, I personally believe that the main reason was the self-organized defense and armed opposition of the Croatian and Muslim people, which protected them from even more tragic Chetnik crimes in many places and brought about their military defeat. Following the war in 1945, all Chetnik criminals were given the opportunity to answer for their crimes of genocide against the Muslim and Croatians and their historical, sacred and cultural monuments in court. Many were even given the chance to continue with these crimes under a different symbol (the communist red star?) 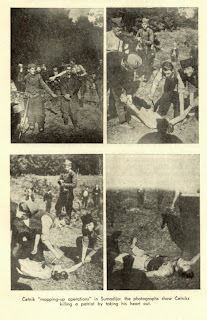 For this reason, it is not coincidental that such genocidal crimes of greater Serbian nationalists and Chetniks occurred in even more appalling forms, with respect to the number of those killed, the number of refugees, and the destruction, against the Croatians and Muslims in the greater Serbian aggression upon the Republic of Croatia in 1991, and then, against the Republic of Bosnia and Herzegovina until today. this blogspot is the only good resource about serbian genocide thank you! Finally the years of Chetnik, Greater Serbian lies, agendas, and cover ups being exposed. Death to Serboslavija. a jos da te priupitam kada će te vi skiniti ljagu sa sebe kretenu za logore Banjicu, Topovske Supe, Dedinje, Sabac, Nis, Semlin (Sajmiste) i skoro 10.000 ubijenih Beogradskih židova?